Do you experience pain, aching or swelling in your lower legs and ankles after a long day on your feet? If so, you are not alone. According to a recent survey nearly one-quarter of women over age 18 reported that they suffer with tired, swollen and heavy legs. If this sounds familiar, then it is time to listen to your legs. These symptoms could indicate that you have chronic venous insufficiency (CVI), a condition that predominantly affects women. The symptoms of CVI are not only uncomfortable but they can affect your daily life. If the first thing you want to do at the end of the day is get off your feet, if leg pain and swelling is impacting your life and you are embarrassed by unsightly varicose veins, then it is time to do something about it. CVI occurs when there is impaired blood flow to the legs. Muscles in our calves and feet contract to push blood through our veins upward toward the heart. Inside our veins are tiny one-way valves that control the flow of blood. When there is damage to the valves, either due to aging, heredity or extended periods of standing, blood can pool in the extremities causing swelling, aching, and throbbing. Over time this can lead to damage to the veins and tissues in the legs, varicose veins and even ulcers. Women are at particular risk of CVI because we have higher levels of the hormone estrogen. Other risk factors include carrying extra weight and occupations that require long periods of standing on your feet. Now here is the good news – there are several lifestyle approaches as well as a natural health product that can help improve the symptoms of CVI. 1. Eat a healthy diet with plenty of vegetables, fruits (especially berries), nuts and seeds. These foods contain soluble fibre, which promotes regularity (and reduces straining on the veins) as well as antioxidants and nutrients that are important to the health of your blood vessels. 2. Drink lots of water. It is essential to flush toxins from the body and keep you and your tissues hydrated. 3. Try Antistax®. This natural health product contains Red Vine Leaf extract. Antistax® is clinically proven to improve lower leg blood flow, reduce swelling in the legs and reduce the heaviness and fatigue associated with CVI. For optimal results, it is recommended to take one tablet a day for a minimum of 6 weeks. You will find Antistax® in the Natural Health section of your pharmacy. 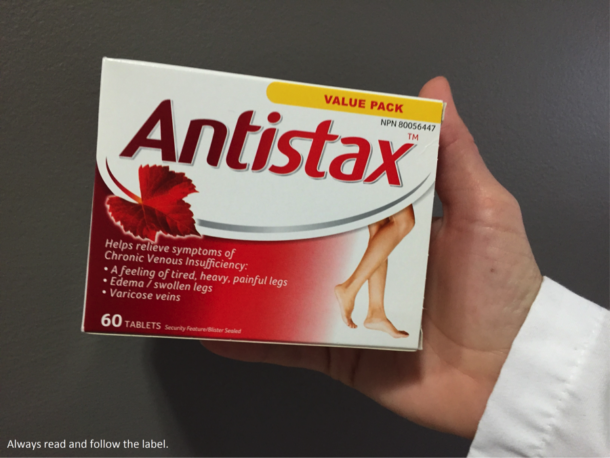 To be sure Antistax® is right for you, always read and follow the label. Talk to your healthcare provider if your symptoms persist or worsen, or if you use the product for more than 12 weeks. 4. Elevate your legs when you are resting. By placing your feet at or above your chest, it is easier for the blood in your extremities to flow back up to the heart. When reading or watching TV at night place a pillow under your ankles. 5. Consider support stockings. These stockings have firm compression and help to encourage blood flow back up to the heart. They are available in a variety of sizes and compression (tightness) and work well in addition to taking Antistax® and the other lifestyle tips above. I share these recommendations as a pharmacist and also as a sufferer of CVI. I know how uncomfortable this condition can be, and I also know it is important to listen to your legs and take action. To learn more about CVI and managing its symptoms, watch this video. *This post was developed in partnership with Sanofi Consumer Health. All opinions and suggestions are my own.